Would a crown of success kit work? yes it could help. search this forum. there are tons of threads and advice about people applying. Try the search terms "application" "college" "scholarship"
I would recommend browsing that thread first. But you can definitely work with the crown of success spell kit, some attraction products to attract the appropriate scholarships to you, and a road opener to remove any obstacles. I can, you can't products would be great too to help you out beat your competiton. Thanks starsinthesky! I never even knew the i can, you can't existed! Also, is it wise to put the "I can, you can't" in t a candle such as Crown of Success? would that be okay? I have been working with a rootworker from AIRR and had them perform a spell for me back in october for school sucess and getting a scholarship. I have not been having any results so far so bascically my question is what should I do if I haven't seen results on an issue after a few months?? Well first off, are you doing the mundane work to get the scholarship and be successful in school? I am saying have you changed your study habits, do you actually go to class, and are you applying to scholarships? If not, then you cannot expect miraculously to get a scholarship and be successful in school. If you are doing those things, then you need to consider getting another reading doing, and see what other work you can do. But with school work the subject, and or major may not be for you. You may need to get some additional school counseling done for that. So I would consult with your worker you are currently working with and if you are still not satisfied, then you can get a second opinion. You should speak to your worker about this. Did they give you any indication that there might be some issues or blocks with the spell work? Many workers are more than happy to schedule follow up readings so that you can discuss the work and how it is progressing. And as usual Stars has also given excellent advice-have you been doing the work on your end that is required to get scholarships and achieve scholastic success? If you have, then speak to your worker, tell them your concerns and see what they recommend. I too feel that you should speak with your worker about your situation (as Devi mentioned) and inquire about possible blockages to your work and ask for recommended adjustments such as integrating a road opener in your work. Good Luck! Hi everyone, I've got a problem I'm in school in a 20 week program to exact I'm half way through, I applied for financial aid and received it already received it. Problem is we go by what the school calls mods it's 4 week sessions and through out that time you can only miss 3 days I went over because my daughter kept getting sick in me and had no one to watch her. But they don't care because they say financial aid won't pay them the school that is. So now they're telling me I will more than likely have to repeat the mod that's a whole month, basically it's up to financial aid I have I have a certain percentage of time in class my second disbursement isn't until may 29 so I have time to make up but the school is just worried about there money. Does anyone know of something I can do so things I'll go my way and financial aid or school won't make me repeat the mod as I did pass it I've passed everything so far. Something sounds fishy at the financial aide office. Your attendance has nothing to do with what financial aide will pay if it is an accredited school. Now if you fail financial aide may put you on probatition until you bring the grade up to passing. I would suggest a petition to St. Irene to help you speak with a clear voice to the teacher who would have the greatest influence about reporting your attendance. Write out the petition like a letter to the Saint telling her the whole situation then place the petition either under the glass encased candle or next to it if it is a long letter. I would also do a little honey jar to sweeten the school to you. Inside the jar place the name of the person you are dealing with at the financial aide office, the name of the school and your own signature. Add some licorice root or chips to the honey jar and speak your wish into the jar. Seal the jar tight. I like to light a tea light on top of the jar for 30 days while saying my prayers. I will turn the jar upside down every so often to simulate someone changing their mind. I wish you the best and please let me know how it turns out. Flora wrote: Something sounds fishy at the financial aide office. Your attendance has nothing to do with what financial aide will pay if it is an accredited school. Now if you fail financial aide may put you on probatition until you bring the grade up to passing. What color candle should I use for honey jar? The school reports your attendance and if it fails below half-time, it will affect your financial aid. You need a purple candle for compelling. Jwmcclin is correct. You have to be in school for a certain amount of hours per each credit/unit. I know you at my school if you have more than two unexcuseable absences that are not justifed through an actual emergency, then you either fall or you are dropped from the course. A) Find a solution for if your daughter gets sick or has an emergency again. I understand its hard as a parent to go to school and raise a child, but its still your responsibility. You need to be prepared as I am sure this issue may come up again. B) I would get the school's logo or a business card from your financial aid office. Perhaps you need to get a business card from the person that is going to make the decision. In any case, I would prepare a honey jar, get some 5 finger grass, you can throw in some licorice, and calamus as well. I would get a purple candle, and then use some compelling oil. You can add some pay me oil as well to the candle so that the financial aid office will pay you. You can make a separate jar with the 5 finger grass, licorice, and calamus for the university to not make you retake those classes over. Also, be proactive in what you want, and keep speaking with someone at the financial aid office, and through the school. I would show them that you have taken measures to get a baby sitter or whatever to ensure that this wont happen again. I would tell them that you ended up passing and you have passed in the past as well. Show that you have a plan of action so that this will not happen again. Yep the same thing as the previous jar. I hate to muddy the waters since you've received excellent advice above but I work in higher education and have run across this problem. Hoping my insight might be of help. There are certainly people at the school who can help you fix this but it may not be the financial aid office so I would hate to see you concentrate all of your effort and energy on working only them. Simplified, here is why without going into the complexities of Federal regulations: Financial aid officers have very little flexibility in this situation due to federal regulations on attendance. You could theoretically work Court Case products since this is a legal issue but that may not be the best use of your time and energy. By all means, sweeten the financial aid office but I would concentrate most of my energy on finding the person who has the power to act as your advocate on this issue and sweeten them. There are people at your college whose job is to help you get through these issues and act as your advocate. You should figure out who that person is and get them on your side by working that Boss Fix and Five Finger Grass to the max. At most schools, this person is a Dean, usually the Dean of Students but find that out by asking your department head, your instructor or looking in the student handbook. Once you figure out who this person is, I would approach them and explain the situation since they can sometimes certify absences in these cases. They may ask you for documentation of your daughter's illness. If your daughter was sick for that long, I am assuming you took her to the doctor at some point and have access to documentation of this. Regardless, find the person who can help you work this out. Finally, I would highly recommend using Crown of Success and High John products throughout your schooling to enhance others perception of you as a good student and to enhance your own work. I know you are a great student but every little bit counts. i need help with school as well the tuition for Summer and the books which I have to buy four more textbooks it is amazing how much things cost, in order for me to graduate next Spring I have to have the Summer Session. AGHHH. I know this reply is late but I hope it helps you or others. You can always appeal decisions made by financial aid. I'm not sure what kind of school you're in but I would speak to a financial aid adviser on the matter. You can always try to speak to a higher up if that doesn't work. Good luck! LM products for Engineering Scholarship?? b) Please please some one guide me if there's a thread that tells me which saints are responsible for which area?? C) I was thinking of burning an orange candle + I can/you cant oil + crown of success oil ON TOP of name paper with name of scholarship+scholarship heads name + name of university = written 9 times.Then OVER THIS... I write my nephews name - bigger writing - 9times. Any ideas of pen, paper, or candle color (I thought orange to open that road for him) Any thoughts? Re: LM products for Engineering Scholarship?? d) although not a question you asked, a nice simple mojo hand for your nephew (not for the scholarship but for his studies in general) would be a piece of Master Root, some Master of the Woods, Peach Tree Leaf, a good-sized chunk of Dragon's Blood and a John the Conqueror root in a red flannel bag. Have him dress that bag with an oil you make from equal parts each John The Conqueror, Crown of Success and King Solomon Wisdom oils. Blessings and let us know how your work goes! I just read an engineering blog that stated that St. Patrick is the patron saint of engineers. Mama Micki wrote: I just read an engineering blog that stated that St. Patrick is the patron saint of engineers. No reason that you can't work with them both For finding an engineering job, St-Joseph would be a great choice. Given he's still doing his studies however, if you want to work with just one Mama Micki's suggestion of St-Patrick would be excellent. LMs All Saints oil can be used successfully for petitionning him. 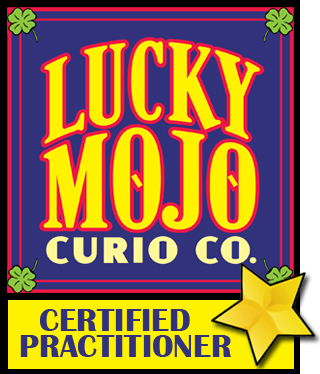 Lucky Mojo has products dedicated to both St. Patrick and St. Joseph. Their feast days are close together (St. Patrick on March 17, St. Joseph on March 19), so if you have anything left over by March, you could thank them both on their days. St. Patrick helped the Irish improve their methods of building bridges and buildings; that is why he can be considered the patron saint of engineering. Feedback: Thanks To LM! - IT's MANIFESTED ! ! THANKS TO LUCKY MOJO - TO: magical catherine yronwode for creating it and doing so much to enlighten our lives TO: aura, mama micki, temont = for answering so promptly with fantastic advice! Love, light and much respect to you all. Tearful ... with joy guys & gals! Though been brought up from childhood working with energy-work/spells/root,herb work/deities etc etc - BUT never has it manifested so quickly as when I started using this wonderful site and products ! MY RESPECT, LOVE AND THANKS TO SAINT JOSEPH, who nurtured Jesus Christ and has so kindly helped me nurture those I love. Beloved St. Joseph I am indebted, humbled and in awe of your kindness and love. BELOVED SAINT PATRICK, Patron Saint of Engineering, my gratitude is endless as I thank you for smiling upon me and granting my wish. I am indebted, and humbled and in awe of your kindness and love. I have been working a honey jar to sweeten our pursuit of a full scholarship from a particular University that our family has attended for 3 generations both vertically and horizontally on the family tree. We have done the work on a mundane level but the initial offer is not close to what we seek despite the numbers being right with regard to SAT,ACT and as a home educated student her transcripts are stunning. We have received full awards from other schools albeit not from a Uni that is exemplary in Classics. I am fresh out of ideas and dressed all documents, had our hands annoited before we met with them and have been working a honey jar with Karo surrounded by sassafrass, Irish moss and Master of the woods in a ring around the jar and a petition for my daughter for a full scholarship at this institution. Please advise as to whether I should Amp up the jar or go another route entirely. Many thanks in advance for your ideas and responses. Update: the most amazing thing occurred tonight. While waiting for my daughter's belly dance class I often go to a little grocery store nearby. In the bread aisle whom did I see but my continental philosophy professor that I have not seen in 25 years. We hugged one another and spent a few minutes chatting about schools, family and she asked if Miss V was thinking of attending the Uni she still teaches at and was delighted to hear we were in the process...I am choosing to see this chance encounter as a sign to keep working , praying and hoping.Or one of my ancestors threw me a sign. Either way it was a beautiful thing to have happen after a week of beating myself up over not doing a good enough job for my daughter. I did amp up the jar with sassafras, buckeye, pyrite and irish moss along with King Solomon oil on the popsicle stick with the name of the desired University. Home schooling was a walk in the park compared to the whole college app process. And it feels icky to draw attention to qualities that are gifts from the Creator. This whole week has been one big shamefest. You may want to keep the honey jar going and add some money drawing work setting your intent on the scholarship money. There is a cute little red book at Lucky Mojo called " The Good Spell book by Gillian Kemp". Inside this book, there is a cute little 14 day candle money drawing spell that works wonders. You may also want to start working with a Loadstone to also attract what you want. You can also find this at the LM shop. Would you suggest any minerals that might be beneficial to this mojo hand? In all honesty the hand that Aura provides is quite solid with what is in it. Personally I wouldn't add anything else. However, if you really need a mineral in the bag then you may consider Pyrite. While it is very well known for drawing money, but it is a strong good luck charm. That is fabulous news Mrs Black Indian! Thanks Sarafina and Shantilly Lace! It is an awesome feeling to be able to help my daughter,especially when she deserves it. I want to petition St. Luke (Patron Saint of Artists) and St Thomas Aquinas to help me with getting scholarships or loans for school. They don't have articles on Lucky Mojo and Google searches haven't turned up much, What is the best way to petition these saints? I would get white vigil candles, a glass of water, white flowers. Then, pray from your heart. Use a petition paper like you would for the other Saints. That's very strange that nothing is turning up. I can't recommend any websites (against forum rules), but I would try harder. Wishing you the best with your scholarships. Hi went and did one year at a college and had to take out a federal loan..years went by before I receive any notice from them.it's now in default and I'm making monthly payments on it where after 9 consecutive payments I'll be out of default and my financial aid will be freed to return back to school and it'll be removed from my credit.. I'm in a program where they help with certain things but even they won't help me until my loans are out of default.. is there any spell I can do to get them to drop much account all together or let me make one payment to pay the last 7months of the arrangements off so that they can take my account out of default spend I can return to school? ?